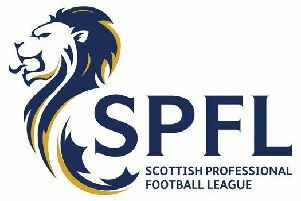 Cumbernauld United suffered a second successive league defeat at the hands of promotion hopefuls Petershill at Guy’s Meadow on Saturday. United got off to the worst possible start losing a goal in the second minute of the match. A long goal kick from Petershill keeper Michael White was flicked on to Stephen McGladrigan on the right and the striker wasted no time in hitting a speculative shot which looped over David Buchanan in the home goal and settled in the net. Petershill, encouraged by this start, kept the pressure on the shocked United men and a great shot from left winger Ian Gold brought out a terrific save from Buchanan. United got themselves together and an effort from Davie Dickson went high over the bar before the Cumbernauld boys had a real opportunity to equalise in the 15th minute. A wonderful pass from Scott Murphy reached John Higgins on the right wing and the young man’s cross found Scott McHaffie in front of goal but the midfielder’s header was smothered by the Peasy keeper on the goal line. United were still in the game but all that changed in the 25th minute. Paddy McCabe, in the middle of the park, beat two Peasy men and then unfortunately slipped on the turf. The ball was quickly despatched to the visitors’ Jason Hardie who wasted no time in beating Buchanan to put Petershill two ahead. More problems came for United shortly after when Billy Robb was shown a straight red card when he was adjudged to have prevented a goalscoring opportunity in clippingMcGladrigan as the striker ran towards the United goal. Ten men United battled well for the opening 20 minutes of the second half but Petershill increased their lead in the 66th minute when, after a great 30-yard run, winger Stuart McCann finished with a terrific strike to put the visitors three ahead. There was no further scoring although David Buchanan had to make a few good saves as the game progressed.